Arthur Ignatius Conan Doyle, who is more often known by his pen name Sir Arthur Conan Doyle, was the writer of the popular Sherlock Holmes series of mysteries. Sir Arthur Conan Doyle was originally a physician before he decided to pursue a career as an author. While Doyle was a physician, he made the decision to begin writing the Sherlock Holmes novels for which he has become so famous. Doyle was born in 1859 in Scotland, and his father was an alcoholic who later remarried. Arthur Conan Doyle was sent away to boarding school in England, where he attended school until the age of seventeen. While he was in medical school, Arthur Conan Doyle met a number of authors who were also attending, including James Barrie (author of Peter Pan) and Robert Louis Stevenson (author of Treasure Island and other books). This helped to inspire him and to develop his love of the written word even further. These early experiences, as well as Arthur Conan Doyle's continued passion for writing over the course of his life, would later lead to his own writing career taking off and eclipsing his medical career. 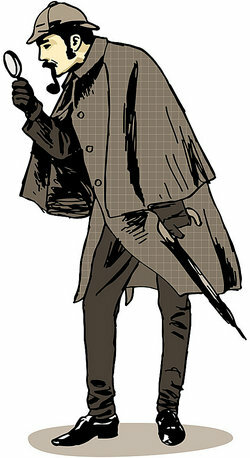 Now, he will always be best known as the creator of Sherlock Holmes. "What Was the Original Profession for the Author of Sherlock Holmes?." YourDictionary, n.d. Web. 25 April 2019. <https://biography.yourdictionary.com/articles/what-was-the-original-profession-for-the-author-of-sherlock-holmes.html>.